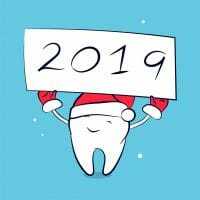 To help you start the new year with a great smile and better oral health, we’ve come up with a list of essentials you will need to achieve this new year’s resolution. Simply brushing your teeth does not always get to the hard-to-reach areas. Flossing is one of the most effective ways to prevent cavities, fight bad breath, tartar buildup, gum disease and improve your appearance. Make sure floss is part of your at-home dental care routine in the new year to maintain your bright smile. Whether you have Invisalign, wear braces, or not, a toothbrush should always be the first line of defense in your oral hygiene routine. Remember to brush gently or use a toothbrush with soft bristles to avoid scraping away your tooth enamel. To maintain your smile throughout the year, be sure to replace your toothbrush every 3-4 months. Not all toothpastes are made the same. Choose a toothpaste that is made of fluoride, abrasives, humectants, flavors, and detergents. These key ingredients strengthen tooth enamel, scrub the tooth’s surface, trap water for a smooth substance, create a foaming effect, and leave an ADA approved sweet taste. When we eat, the sugar from our food can stick to the tooth’s surface. Cavity-causing bacteria can increase with a dry mouth. Keep a water bottle on hand this year to rinse away sugar and acid until you’re able to brush again. You may even notice other health benefits from frequent water intake. Did you know that fruits and vegetables high in fiber are great for cleaning your teeth? Try snacking on foods like apples, celery, carrots, yogurt, or almonds to naturally fight bacteria, balance your mouth’s pH, and treat gum disease. While at-home dental care is essential to maintaining great oral hygiene, scheduling regular visits with your dentist or orthodontist is strongly recommended. Contact our office to schedule your first visit of the year and bring yourself one step closer to a new smile and better hygiene. We have loved every part of our experience with Boyd Orthodontics! Super cheerful staff, patient and professional. Thank you for Annie’s beautiful smile! I am currently going to a different orthodontist but I was having wire issues and I called and asked if they could clip my wire and I’ve never met a nicer company to jump in and be able to help as quickly! Fully recommend them. Thanks guys!!!!! Dr.Boyd and his staff are absolutely the best!! The environment is pleasant and inviting- everyone there is so warm and friendly. They truly care about providing the best customer service for their patients. I would highly recommend them to anyone!